I have another Noodles holiday polish to share with you today. I absolutely loved her holiday collection, and I'm continually impressed by the ones I purchased. This is next one is a glitter topper. I love glitter toppers during the holidays. I don't do nail art, and glitter toppers are the perfect way for me to make fun and festive manis! Can't Catch Me is a clear based glitter topper with metallic bronze, rust, and caramel glitters as well as red and green glitters. 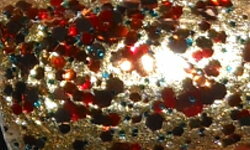 Color: I love the colors in this glitter topper. It has the traditional red and green glitters for Christmas, but instead of doing the typical gold glitter, Noodles went with brown toned glitters. This really gives it a rich look. I love it over gold as it reminds me of some pretty Christmas wrapping paper. Formula: Excellent glitter topper formula. I didn't have any issues applying this glitter. It applied easily and smoothly to the nail. Price: This is $8.50 on Noodles Nail Polish etsy site. Overall: Perfect holiday glitter topper! I don't see many indie brands doing glitter toppers more, so I really appreciate Noodles making one. I love the color of the glitters and how it looks over gold. The formula is great and I'm all around pleased!